Thessaloniki's biggest club lack the titles that their Athens and Piraeus rivals have won, but their position in Greece's football elite is indisputable. As for why PAOK haven't won more trophies, even in the 70s, when they had the strongest team in the country, it is common knowledge in Greece that it has had nothing to do with their quality and strength, but it purely came down to how favored other clubs have always been by people in a position to influence the result of matches in Greece's competitions. Toumba Stadium, PAOK's iconic home since 1959. Panthessalonikios Athlitikos Omilos Konstantinoupoliton (thankfully shortened to PAOK), stands for Pan-Thessalonikian Athletic Club of Constantinopolitans, with the later word being how people from Constantinople, Istanbul, are called in Greek. The club were founded in 1926 by Greek refugees who had to flee Istanbul (as well as the rest of Asia Minor) and settle in Thessaloniki (capital city of Macedonia, a region in northern Greece), and other parts of the country in 1922, following an agreement between Greece and Turkey to exchange population. PAOK's roots can be traced back to Hermes, a sports club founded in 1877 by members of the Greek community in Pera, an Istanbul district. The club's colors have always been black and white, black for the sorrow related to countless thousands of Asia Minor Greeks who were forced to leave the land their ancestors had been living in for centuries, and white for the hope of a new beginning that came with settling in a new home. For the first three years of their existence, the emblem of PAOK was a four-leaf clover, almost circled by a horseshoe. The double-headed eagle, a symbol of the Byzantine empire (of which Constantinople was the capital city), a mournful version of it (with the wings closed instead of stretched), was adopted as the club's new emblem in 1929. Initially, the team played their home games downtown Thessaloniki, at a stadium commonly called “Sintrivani” (from a Persian/Turkish word, meaning “fountain”. Obviously, there used to be one in that area of Thessaloniki's downtown). 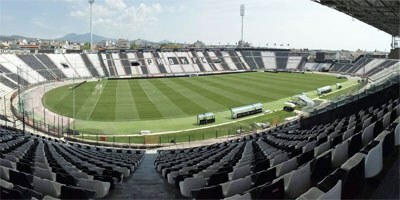 Toumba Stadium, well-known Europe-wide for the impressive atmosphere created by PAOK's fans, was constructed in the late 50s, mostly thanks to contributions of simple fans. The club resorted to the solution of running a lottery, and people would buy tickets. More than that, thousands of PAOK supporters offered labor time as volunteers, mostly in the afternoons and early nights, after finishing from their proper daytime jobs. PAOK, the “Double-headed” (“Dikefalos”), as the team are affectionately called, had been successful at local (Thessaloniki and Macedonia) level, throughout the first decades of their existence, but it was in the 70s that the club won nation-wide recognition and admiration, playing some of the best football Greek fans have ever seen. It all started in the 60s, when legendary secretary general and later president Giorgos Pantelakis started executing an ambitious long-term plan to see PAOK at the top. Slowly but steadily, the team gave the chance to more and more youngsters to grow, while at the same time recruiting even more talented young players mostly from northern Greece. In the late 60s the team were already full of top class players, the puzzle was assembled, PAOK were ready to win what their quality as a team deserved. In terms of titles, they didn't. A single championship and two Cup trophies was all the team managed in the 70s, half because other teams were strong as well (Panathinaikos for example reached the European Cup final in 1971, played at Wembley against Ajax), and half because PAOK lacked the off-field power to ensure that the team would be given a fair chance by the referees and the whole system that was ran football in Greece. The single fact that during the 70s, PAOK reached the point of having their whole starting lineup playing for Greece's national team, in times when Greek football had players who had attracted interest from European football titans, speaks volumes about the level of that PAOK side. As for Pantelakis, who died in 2009, aged 83, hit by a motorcycle downtown Thessaloniki, passed in PAOK's history not just as the creator, more or less, of that epic 70s team, but also as the man who stood up to members of the military government that ruled Greece from 1967 to 1974. Olympiacos had managed to convince Giorgos Koudas, PAOK's brightest star, to move to Piraeus. Technically, PAOK had to agree, which of course they wouldn't. Pantelakis was repeatedly called, even threatened by members of the government to sign the transfer papers, which he never did, insisting that the dictatorship rulers who ran the country at that time would only see Koudas move to Olympiacos by signing a decree, just like they had done when they abolished democracy, in a single night. Koudas ended up spending two years inactive, he only played in friendly games for Olympiacos, and finally returned to PAOK (from where, officially, he had never left), and went on to become the club's record holder in appearances, and second all-time scorer, just a handful of goals behind teammate Stavros Sarafis. Sarafis, 'Caesar', as he was affectionately called, was another member of PAOK's legendary 70s team, serving the club later from a series of other positions as well, just like Koudas. The 70s brought PAOK international recognition as well. In 1974 they reached the quarterfinals of the Cup Winners' Cup, eliminating Legia Warsawa and Lyon, both extremely strong at that time, before losing to AC Milan. The 4-0 triumph at home over Lyon and the 2-2 draw to Milan are the most memorable results of that European campaign. Two years later, PAOK beat Johan Cruyff's Barcelona at Toumba Stadium in a UEFA Cup game, before getting eliminated with a heavy defeat at Camp Nou. Ever since then, PAOK have caused major upsets to much bigger rivals in UEFA competitions, with their success over Arsenal in 1997 a very characteristic example. In the first part of the 21st century the club went through a series of financial troubles. A long period of uncertainty came to an end in August 2012, when Greek-Russian businessman Ivan Savvidis took over, paying off the entirety of the club's inflated debt, and setting off to create a team able not just to win titles in Greece, but become an even more respectable player at international level as well. PAOK's first logo back in 1926 was a horseshoe and a four-leaf clover, both symbols of good luck. Three years later the club adopted the double-headed eagle as an emblem, a symbol of the Byzantine empire, with one major difference; the wings were closed, instead of stretched, symbolizing the mourning that came with PAOK's founders, refugees from Constantinople, having to leave home a few years earlier, along with countless other thousands of Greeks. The club's crest had never included a third color (other than black and white) until 2013, when a new, modernized logo was adopted, including a golden outline.